This course is designed to give clinicians the confidence to perform soft tissue grafts, appropriate flap design for full and partial thickness flaps, suturing and advanced bone grafting procedures upon returning to their offices. Our structure is a combination of in-depth lecture, over the shoulder demonstration and a hands-on workshop with models and fresh frozen cadaver heads on advanced bone grafting for implant placement. One of the unique features of our course is that we provide panoramic radiographs of every cadaver head to simulate a realistic learning experience. 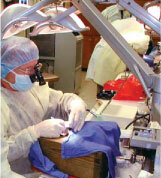 This is the closest thing to performing live surgery! Each participant will receive a comprehensive manual which compiles Powerpoint slides from the lecture, as well as current literature covering specific surgical procedures. This makes following the lecture more enjoyable than having to take detailed notes, and provides an excellent reference back in the office after the course. Each participant will also receive a personalized monogrammed scrub as well as a soft sided attaché. Course Director: John Russo, D.D.S., M.H.S. is a graduate of The Ohio State University College of Dentistry. He completed his periodontal training and earned a Master in Health Sciences degree from the Medical University of South Carolina. Dr. Russo is a Diplomate of the International Congress of Oral Implantologists. He is in private practice in Sarasota, FL and is a clinical assistant professor at the Medical University of South Carolina in the Division of Periodontics. He is an author and an International lecturer on bone grafting and dental implant surgery. Dr. Theirry Bacro. Associate Professor, Department of Cell Biology and Anatomy. Dr. Bob Gellin. Interim Chair of the Department of Stomatology, and Professor and Director of the Division of Periodontics, Medical University of South Carolina. Dr. Joe Krayer. Assistant Professor and Director of the Graduate Program in Periodontics, Division of Periodontics, Department of Stomatology, Medical University of South Carolina Dr. Renata Leite. Assistant Professor, Division of Periodontics, Department of Stomatology, Medical University of South Carolina Dr. P. D. Miller. Recognized as an international expert in the field of soft tissue grafting, having introduced new concepts and procedures to Periodontics. 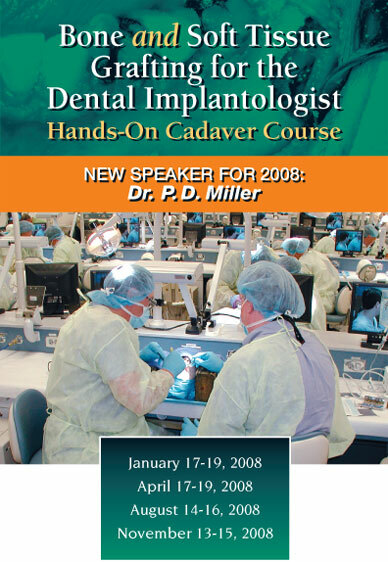 This entry was posted by Dental Continuing Education on July 7, 2008 at 2:38 pm under Bone Grafting, Soft Tissue Grafting. You can leave a response, or trackback from your own site. Follow any responses to this entry through the RSS 2.0 feed.